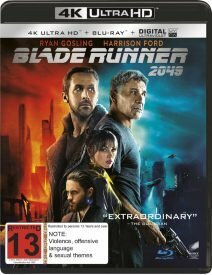 New Zealand missed out on the 4K-UHD re-issue of the original Blade Runner but is part of the global release for Blade Runner 2049. A Few Words About … calls the transfer “absolutely gorgeous” as it’s sourced from 4K data files. This makes it a bit of a rarity in the 4K home video world, which is still mostly up-rezzed data. The razor-sharp images, combined with neatly applied HDR, yield a superb presentation, especially with the original Dolby Atmos tracks, which are huge, from logo on, and theatre filling. “The 1080p transfer looks solid and this Ultra HD rendering takes it up a notch with a discernible increase in detail, and emboldened highlights, both light and dark,” AVSForum said. Stylistically speaking, Blade Runner 2049 isn’t the type of film that is going to dazzle with its use of eye scorching dynamism or vivid color. There is no question that its Ultra HD presentation appears faithful and makes for a distinct improvement when compared to the 1080p Blu-ray rendering. Also out on 4K-UHD is Darren Aronofsky’s Mother! “Aronofsky’s psychological horror fable breathes life on 4K Ultra HD with a great-looking if also arguably underwhelming HEVC H.265 encode in Dolby Vision HDR,” High-Def Digest said. “Considering the film’s visual roots are a mix of Super 16mm, digital, and CGI rendered at approximately 2K, Mother! wouldn’t seem like the most necessary candidate for Blu-ray—let alone 4K UHD, available separately—but this 1080p transfer serves up a perfectly capable and accurate presentation,” DVD Talk said. Also new are 6 Days, Acts of Vengeance and Happy Death Day. Looks like NZ BD buyers get short changed again. No Atmos soundtrack that is offered on the US region A/B BD.